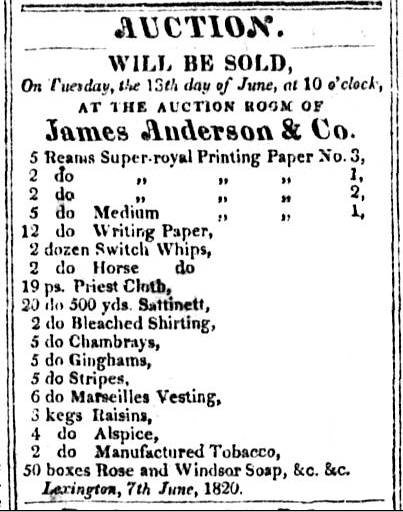 James, who years later would have a “very successful career as auction and commission merchant,” is likely the planned recipient of Robertson’s lost books. Lexington stores like Anderson & Co. would often allow themselves to be the mailbox recipient for large packages sent to rural consumers. This relationship was firmly based on mutual trust. All in all, it is unlikely that Anderson was to blame for Robertson’s lost library. The date of July 1820 may shed some light on what might have happened to Robertson’s books. In January 1819, the cotton market dropped 25% in what economists would later see as the first sign of the great depression known to historians as the Panic of 1819. The slow economic recovery of Europe from the Napoleonic Wars led to a global monetary crisis. The Bank of the United States would respond by calling in debts and seeking to return gold specie back to its vaults in Philadelphia. In the Western country, this led to similar tightening of credit by state and independent banks. Businesses collapsed, farms went under, and the ready cash necessary for commerce was lacking. Frontier states like Kentucky and Ohio were hit hard by the crisis. It is very possible that Robertson’s unnamed bookseller was scrambling to avoid bankruptcy, putting off his customers with white lies while hoping for a loan to set things right. An Angry Old Man in a Hurry? If Robertson held his temper over his lost books, he did not do so in an incident during the Civil War that placed a stubborn Judge Robertson up against the 22nd Wisconsin and its equally headstrong commander—a conflict so politically sensitive that it ended up on the desk of Abraham Lincoln. It all began in 1862 when a 19-year-old slave that Robertson owned (but leased to an “Irishman”) ran away and sought refuge among the Wisconsin troops then stationed in Lexington. Robertson had long opposed slavery in theory but had still owned a few slaves. This particular slave, Adam, had apparently suffered real abuse from the man Robertson had entrusted with his care. In 1861, Robertson had enthusiastically declared as a Unionist; but as the war had progressed, it became necessary to station more U.S. troops in Kentucky and the Northern-raised troops tended to clash with the locals. When he arrived at the camp of the 22nd Wisconsin, Robertson asked for the return of his slave but was smartly rebuffed by Col. William T. Utley. As related later by Utley’s friend and the unit’s chaplain, George S. Bradley, Robertson declared he was a citizen of a loyal state and Utley had no right to confiscate his property. He explained that he “never liked slavery” and was the “only man living who had voted for the Missouri Compromise” but, as a loyal Kentucky Unionist, his property could not be legally confiscated. Utley responded that he “had never had much confidence in the loyalty of Kentucky” and that he didn’t think himself subject to the laws of Kentucky. 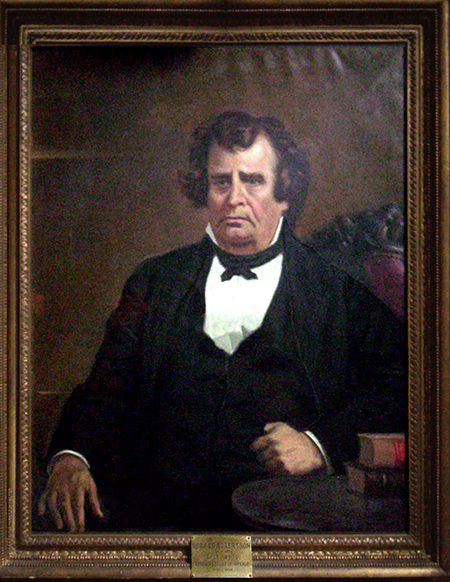 While Utley and the Wisconsin 22d decamped to Tennessee, Robertson rode his indignation back into the Court of Appeals in an 1864 election campaign based on anger against the Union troops in the state. He would eventually win his lawsuit and successfully enforce the $935 judgment against the federal government in 1871–well after the purported principle was mooted by the end of the war. At his death in 1874, Robertson was lauded as one of the state’s greatest citizens. But as new generations assess the horrors of slavery more critically, this incident continues to tarnish his reputation. It is hard to take one’s record of opposition to slavery seriously if you end your career angrily suing people over the loss of a much-abused young slave. History has not recorded what happened to Robertson’s two boxes of missing books in 1820. Perhaps he wrote them off as a loss to the turbulent times. That certainly would have been Robertson’s wisest course in 1862. Kurt Metzmeier is associate law librarian at the University of Louisville Brandeis School of Law. He is the author of Writing the Legal Record: Law Reporters in Nineteenth-Century Kentucky (University Press of Kentucky, 2016). The biographical literature on Robertson is extensive. George Robertson wrote two books with significant biographical material, Scrap Book of Law and Politics (Lexington, n.p., 1855) and Outline of the Life of George Robertson: Written by Himself (Lexington: Transylvania Printing & Publishing Company,1876) and there are entries on the judges in major state encyclopedias. Robert M. Ireland, “George Robertson” in Kentucky Encyclopedia (Lexington: University Press of Kentucky, 1993):776 and H. Levin, ed., Lawyers and Lawmakers of Kentucky (Chicago: Lewis Publishing Company, 1897): 71. Both as a student and later as a judge himself, Harlan idolized Robertson. If Robertson had been placed on the U.S. Supreme Court, he later wrote, he would have “left a royal heritage as jurist of our nation.” See Loren P. Beth, John Marshall Harlan: The Last Whig Justice (Lexington: University Press of Kentucky, 1992):17-18. Robert M. Ireland’s entry in the Kentucky Encyclopedia reflects a century-worth of consensus in Kentucky. Peter Karsten in Heart Versus Head Judge-Made Law in Nineteenth-Century America (Chapel Hill, N.C.: University of North Carolina Press, 1997) highlights Robertson’s impact on Southern jurisprudence. 3 Stat. 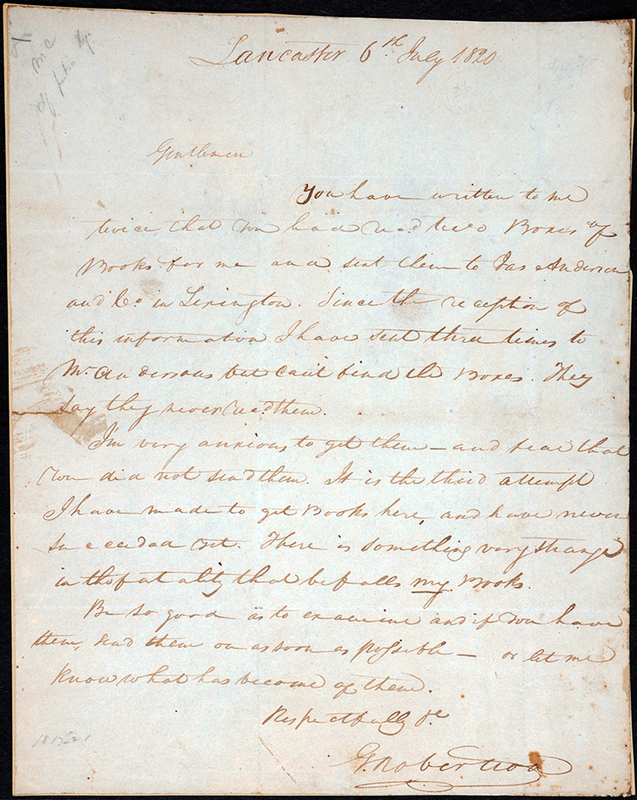 493 (March 2, 1819). The rise of Kentucky book culture is well-documented. The spread of literacy, book publishing, and libraries are surveyed in William Henry Venable, Beginnings of Literary Culture in the Ohio Valley, Historical and Biographical Sketches (New York: P. Smith, 1949) and in Howard H. Peckham, “Books and Reading on the Ohio Valley Frontier,” Mississippi Valley Historical Review 44 (1958),649-63. Kentucky’s own pioneer publishing industry was well-established by the 1820s. See William Henry Perrin The Pioneer Press of Kentucky ( Louisville: John P. Morton & Co, 1888) , Willard Rouse Jillson, The First Printing in Kentucky; Some Account of Thomas Parvin and John Bradford and the Establishment of the Kentucky Gazette (Louisville: Dearing Printing Co., 1936). and Douglas C. McMurtrie, John Bradford, Pioneer Printer of Kentucky (Springfield, Ill: n.p., 1931). William A. Leavy, “A Memoir of Lexington and Its Vicinity,” Register of the Kentucky Historical Society 40 (1942): 107-31, 253-67, 353-75; 41, (1943): 44-62, 107-37, 250-60, 310-46; (1944): 26-53. See Walter Sutton, The Western Book Trade Cincinnati As a Nineteenth-Century Publishing and Book-Trade Center (Columbus: Ohio State University Press for the Ohio Historical Society, 1961). “Nursery of a Supreme Court Justice: The Library of James Harlan of Kentucky, Father of John Marshall Harlan,” Law Library Journal 100 (2008):639-74. These economic dislocations ravaged Kentucky commercial life in the 1820s. Politicians who wanted the state to forgive crushing debts on citizens even replaced the state’s high court when it struck down relief laws, leading to “court controversy” in 1824-25 when Kentucky had two rival appellate courts. See Kurt X. Metzmeier, Writing the Legal Record: Law Reporters in Nineteenth-Century Kentucky (Lexington: University Press of Kentucky, 2017). Lincoln had practiced law in Kentucky courts alongside Robertson, who also was a neighbor and friend of Mary Todd’s family in Lexington. See especially William H. Townsend, Lincoln and the Bluegrass: Slavery and Civil War in Kentucky (Lexington: University Press of Kentucky, 1955) and Lowell H. Harrison, Lincoln of Kentucky (Lexington: University Press of Kentucky, 2000). Lincoln to Robertson, Aug. 15, 1885, quoted in Harrison, Lincoln of Kentucky, 92. In a June 16, 1858, speech accepting his nomination in Springfield as the Republican candidate for the U.S. Senate, Lincoln discussed the conflict over slavery: “In my opinion, it will not cease, until a crisis shall have been reached, and passed. A house divided against itself cannot stand. I believe this government cannot endure, permanently half slave and half free. I do not expect the Union to be dissolved—I do not expect the house to fall—but I do expect it will cease to be divided. It will become all one thing or all the other.” See Mario M. Cuomo, ed. Lincoln on Democracy (New York: Fordham University Press, 2004), 105-114, 105. Townsend, 299-304), and Harrison, Lincoln of Kentucky, 233-35, relate the story from Kentucky sources. George S. Bradley, The Star Corps: or, Notes of an Army Chaplain (Milwaukee: Jermain & Brightman,1865), 63-79, and E.W. Leach, Racine County Militant; An Illustrated Narrative of War Times (Racine, WI: Leach, 1915), 97-106, provide the Wisconsin prospective. Leach, Racine County Militant, 100. Rev. Stat. of Ky., ch. 93, art. 5, sec. 1-5 (1852). Utley to Randall, Nov. 17, 1862, quoted in Townsend, Lincoln and the Bluegrass, 303-04. Lincoln to Robertson, Nov. 26, 1862, quoted in Townsend, Lincoln and the Bluegrass, 302. Robertson to Lincoln, Dec. 1, 1862, quoted in Harrison, Lincoln of Kentucky, 235. Harrison, Lincoln of Kentucky, 190-91. Harrison, Lincoln of Kentucky, 235.